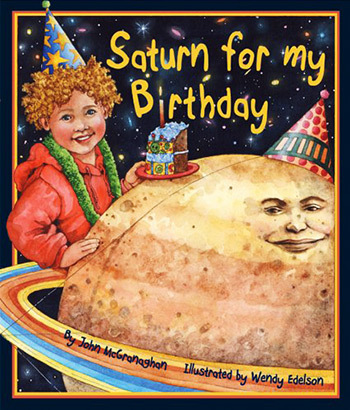 Saturn for my Birthday by John McGranaghan, illustrated by Wendy Edelson, is a delightful picture book that will introduce children to one of our solar system’s most beautiful worlds. With this book, the publisher, Sylvan Dell, adds to their list of lavishly illustrated humorous picture books on various science topics. This book, similar to the others I’ve seen, includes an activity that parents and kids can do together. They deserve high marks for their efforts to encourage science learning through playful stories, fact pages, and activities. This book’s premise is simply stated in the title: a child asks for Saturn for his birthday. Anticipating his father’s objections, the boy carefully explains his plans to take proper care of Saturn. From one silly spread to the next, the boy details how he will wrap the planet with a blanket (Saturn is really cold! ), give it a bath (Saturn floats! ), and always put it away when he’s done playing with it. Along the way, the boy parrots information about the planet that he’s learned from his teacher (Mrs. Cassini), such as how far away it is (so Dad needs to order it right away), and that it has lots of moons and rings. It is hard to critique the science in this book because so much of it is tongue-in-cheek! Though I applaud the style and love the illustrations, I am a little concerned that the children may remember the boy’s humorous misinterpretations of the facts instead of the actual facts — which are clearly explained in the appendix of the book. For example, the boy says he won’t need any night lights because he will place Saturn’s moons around his bedroom. (Mythology buffs will enjoy the subtle humor here such as Tethys by the fish tank and Janus above the door!) The appendix states: “The moons don’t make their own light but they ‘glow’ by reflecting the light from the sun — just like our moon does.” This is correct, but not many young children know what this means. They may think the moons are like those phosphorous stars that charge up in the light and glow on their ceilings. To make it clear that the moons will not glow, I suggest parents explain that they are made of rock and would not glow in the dark. Another possible misunderstanding that the book reinforces multiple times is the idea that the rings are solid. In all the illustrations, Saturn’s rings are shown as solid — the TV remote sits on them in one. The boy gives them away to friends at school where they are used as a hoola hoop, bracelet, and earrings, for example. The artist did compensate somewhat for this by adding little drips and crystals of ice here and there, and also was careful not to show the rings attached to the planet. The appendix states: “The rings are not solid. In fact, they are floating pieces of ice and rock that are ‘held together’ by the gravity from both Saturn and its many moons.” This is correct, and hopefully would allow the parent to explain that the rings go around like adults, children, and dogs running around a track, with the near ones going around faster, and none of the individuals being attached to each other. But the activity that follows, making edible rings, once again reinforces the idea that the rings are solid. The activity makes a ring out of ice cream and nuts. It is great that the children will understand that the rings would melt here on Earth — but I bet most of them will be left with the impression that they are solid and rotate like a hoola hoop. The book includes an out-of-date list of the moons of Saturn, and the promotional material highlights it by saying “Jeffrey wants Saturn for this birthday, and he wants the moons, too — all 47 of them!” The total currently stands at 60, not 47. The number does not appear in the main text, only in the appendix, where the author wisely added “and scientists keep finding more.” The appendix lists 34 named moons and 13 unnamed ones. The current list includes 52 named moons and 8 unnamed ones. One moon was discovered in 2005, 8 in 2006, and 4 in 2007, with many of them receiving official names in April 2007. It is unclear why the author used data from 2004. Perhaps the educators at NASA/JPL, who are acknowledged in the book as having fact-checked it, did their check back in 2004 and the book was delayed. I recommend the National Space Science Data Center, maintained by NASA Goddard, as a good source for parents who want the latest list (see Saturnian Satellite Fact Sheet), or a simple search of press releases via Google. However, the number of moons does not play a major role in the story, and is likely to keep changing, so no real harm is done by having an old number. Another minor issue with the moons is the relative sizes shown in the bedroom scene. While it is obvious that the illustrations are not to scale, it would have been fairly easy to show Calypso and Atlas much smaller than the others, and that those moons and Janus are not round. In reality, Titan is about 5 times bigger than Tethys, Mimas is about half the size of Tethys, and Janus about a fifth the size of Tethys. Atlas and Calypso are 30 times smaller than Tethys. Unfortunately, no clarifying information on their shape and sizes is included in the appendix. Overall, this book left me smiling and wanting to get a copy to share with my preschool nephews. I highly recommend Saturn for my Birthday as a playful and engaging book for young children and their parents to enjoy together.